Australia has stepped up the fight against antibiotic-resistant strains of tuberculosis (TB), opening a $1.2 million high biosecurity laboratory in Sydney last Tuesday. The opening of the high-containment laboratory preceded World Tuberculosis Day on March 24, commemorating 130 years since Robert Kock discovered Mycobacteriumtuberculosis, the bacterial species that causes the disease. The new laboratory, located at Sydney’s Centenary Institute, contains new instruments that will allow medical researchers to identify cells infected with TB in ten minutes, a process that used to take three weeks,. Tuberculosis usually attacks the lungs, causing a chronic cough with bloody phlegm. It is spread via droplets from a cough or sneeze from an infected person showing symptoms. While the bacteria lie dormant and cause no symptoms in the majority of infected people, about 10% of latent infections result in active tuberculosis. If untreated, TB can spread to other organs of the body and kills approximately 50% of infected people. Tuberculosis is treated with a six-month course of a combination of antibiotics. To ensure the whole treatment is completed, patients must take the antibiotics under the supervision of health officers. A 54 year old woman was admitted to hospital with fever, loss of appetite and weight, cough and weakness of six weeks duration. She had had contact with an uncle, who died of pulmonary tuberculosis 25 years earlier. A chest X-ray showed tuberculosis lesions at the top of both lungs, and tubercle bacilli, the bacteria responsible for tuberculosis, were recovered from her stomach. She died a few days after admission. 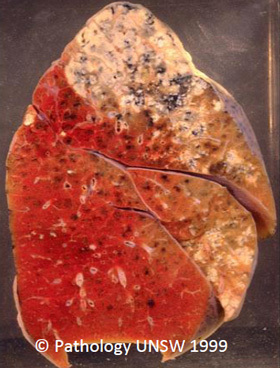 The specimen shows advanced tuberculosis of the right lung, with large areas of whitish, crumbly tissue in the upper portion.